The organized picks and round one standings for 2014's first major are on the site. We chose 26 golfers. No Tiger, so no one unanimous. Defending champ Adam Scott and last week's choker Matt Kuchar are the favorites, picked 12 times each. Three time Masters winner Phil Mickelson shows up 11 times. The 2011 63 hole leader Rory McIlroy and 2013 3rd place finisher Jason Day are on 9 teams each. 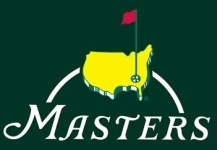 2007 Champion Zach Johnson and rare Masters contender Sergio Garcia were chosen 7 times each. Next we jump all the way to the treys, which include past champion Bubba Watson, Masters rookies Patrick Reed and Jordan Spieth, and occasional contenders Graeme McDowell, Luke Donald and Dustin Johnson. Even more deuces than treys. The only past champion deuce is Trevor Immelman. He is joined in the 2-picked spot by Brandt Snedeker, Harris English, Hunter Mahan, Jason Dufner, Justin Rose and Lee Westwood. Six unique picks. Jordie and Brian have 2 each. Dan and Mike D. have 1 each. The other 11 of us missed out on a Masters unique, but everyone has at least one deuce or trey except Steve.